Empirical and theoretical research on government competition and collaboration identifies several important macro-level characteristics that can affect these forms of interaction between local governments within the same large jurisdiction. These characteristics are fragmentation of governments, fiscal dispersion of governments, sorting of population by governments, and decentralized fiscal responsibility between state and local governments. This study presents indices to measure these characteristics and examines how metropolitan regions in the United States with populations greater than one million are distributed on these indices. The study also examines how these regions compare on conditions that are likely to motivate sales tax competition between municipal governments. The article is behind a pay-wall so I will not reproduce more here, but it is worth digging up. Details: Macro-Level Determinants of Local Government Interaction: How Metropolitan Regions in the United States Compare. Rebecca Hendrick and Yu Shi. Urban Affairs Review, May 2015; vol. 51: pp. 414-438, first published on April 15, 2014. ALPS is this weekend in Athens, Georgia. Download ALPS Final Schedule here. Wish I could be there...next time. “Pathways to Deep Decarbonization in the United States”. States while maintaining a vigorous economy? decarbonization in their own countries. and sign up for the lectures list serve. Can UberPOOL Make Carpooling Cool? As readers of the blog know, I have not been a fan of Uber's scorched-earth approach to skirting level-playing field legislation and the company's simultaneous effort to seek out legislation that preferences their way of doing business. That said, I am willing to acknowledge the potential land use and environmental benefits of their new UberPOOL car-pooling service, which they have rolled out in several cities. Last week, Uber released some data on this new service, which is quite remarkable. In short, UberPOOL might do what long-languishing ride-share programs have tried to do for decades: get people to carpool. The real test of whether UberPOOL is a land use and environmental success, in addition to being an economic success, will be whether people will use UberPOOL when going from suburban location to suburban location. In my reading of the blog post, UberPOOL has not yet been tested in the 'burbs. Here is the link to the UberPOOL release, which has interesting maps like these. San Francisco uberPOOL pickups from matched trips, Feb 20 – Mar 20 2015. Owing to people density, most pickups occur in the city center: SoMa, the Financial District and the Civic Center. San Francisco uberPOOL drop-offs from matched trips, Feb 20 – Mar 20 2015. Hotspot areas include far flung neighborhoods from the city center such as Richmond and Sunset in addition to the Mission and Marina District. NYC uberPOOL pickups from matched trips, Feb 20 – Mar 20 2015. Midtown Manhattan, home of Grand Central Station and Penn Station, is the most concentrated neighborhood for pickups. NYC uberPOOL drop-offs from matched trips, Feb 20 – Mar 20 2015. Drop-offs are spread out across Manhattan and Brooklyn with many areas seeing similar numbers of people heading there. Paris uberPOOL pickups from matched trips, Feb 20 – Mar 20 2015. Paris pickup and drop-off hotspots stand out in areas known for their culture, such as the Bastille neighborhood and parts of Champs-Elysses and Vaugirard. Paris uberPOOL drop-offs from matched trips, Feb 20 – Mar 20 2015. LA uberPOOL pickups from matched trips, Feb 20 – Mar 20 2015. In Los Angeles, popular pick-up locations are areas surrounding the UCLA and USC campuses, in addition to West Hollywood, Santa Monica, and the area near LAX. LA uberPOOL drop-offs from matched trips, Feb 20 – Mar 20 2015. Like our other uberPOOL cities, drop-offs are more spread out across the cityscape and span a diverse array of neighborhoods. Are Earth Day cookies an endangered species? I contemplated posting something serious about Earth Day and land use today. But then, I began to think, you know, every day is Earth Day here at Land Use Prof Blog, and so I thought about what was really on my mind today. And that is Earth Day cookies. Here is my plight: I am teaching an Environmental Law survey class this semester and I wanted to buy Earth Day sugar cookies like the ones below. I tried three grocery stores and came up empty handed. In lieu of Earth Day cookies, my students received butterfly and tulip cookies, which was the best I could do from the local Whole Foods. I seem to recall that these globe cookies were a staple of my Earth Day experience growing up and they used to be quite easy to get. Have Earth Day cookies become an endangered species? Are they hopelessly un-cool by now? I certainly hope not; they are delicious. Trends in the sharing economy have spurred complex legal and regulatory issues that have moved to the center of urban policy debates, from Berlin to Seoul to New York City. As web-based, peer-to-peer companies challenge traditional regulatory paradigms, state and local governments are trying to respond creatively to rapidly changing digital and economic landscapes. This conference will explore the relationship between the sharing (or “peer-to-peer”) economy and economic and community development, consumption, ownership, mobility, and a shifting urban workforce. It will investigate diverse approaches to legal and regulatory issues facing city governments, entrepreneurs, workers, consumers, and residents in today’s dynamic technological and built environments. The goal of the event is to advance new possibilities for problem solving in this transforming area of urban law and entrepreneurship. Way back in 2005, in my last year of a dual degree in law and urban planning, I had the good fortune of participating in a studio project at Berkeley with Tim Duane and Randy Hester, which dealt with the siting of telescopes at the top of Hawaii's Mauna Kea. The problem was that while Mauna Kea was arguably the best place in the world to build astronomy observatories, the same land were also among the most sacred of spots for Native Hawaiians. The weeks our class spent in Hawaii learning about those issues still rate among my most enriching experiences in land use law and planning. In the decade since our visit there, the issues that underlie the conflict between Native Hawaiians and the telescopes have not changed. 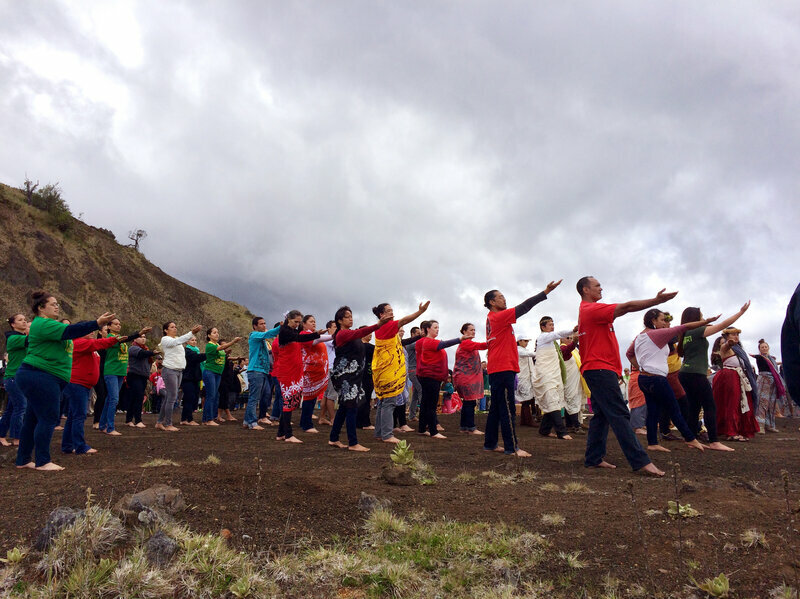 This morning, NPR had a story about the latest effort to build an 18-story telescope at the top of the mountain, and the building resistance against the observatories among Native Hawaiians. It is worth a listen. Percent-for-art ordinances beautify the urban public realm by creating dedicated and consistent funding for public art in urban public spaces, such as municipal buildings and parks. They dedicate anywhere from one half to two percent of the funding for qualifying projects to public art. As a consequence, it is a rare airport these days that has not been kissed by percent-for-art’s bounty in the form of whimsical, delightful, even challenging, public art. In contrast, the urban American street largely has been ignored in percent-for-art regimes. The urban street is as much urban public realm as these more conventional public spaces and is one of the city’s largest land uses. All too often, this street is one that is aesthetically mean - characterized by beat-up, pock-marked wooden utility poles, grey, lifeless steel street lights, and traffic signals dangling like last year’s Christmas lights. The Article asserts that the streetscape and street are as much public realm as the airport, library, and park, and, therefore, are as deserving of public funding for public art as these more conventional public spaces. Currently, a number of percent-for-art regimes appear to be normatively biased against the street, but less so against street furniture. This paper similarly advocates that the definition of public art in a number of percent-for-art regimes be broadened to include the furnishings of the street, the utilitarian - even pedestrian - features of the urban streetscape that comprise so much of it and that do the people’s quiet bidding of collecting trash and recyclables (rubbish and recycling bins), lighting the way (street and pedestrian lights), protecting us from the elements (bus and transit shelters), and ensuring steadiness on our feet (pavement). Though they are utilitarian, street furnishings also have expressive potential and can be re-imagined as new canvases for a more contemporary public art that marries function and form, as compared to the conventional stand-alone piece. This topic, as well as public art and percent-for-art ordinances generally, remain vastly under-explored in the legal academic literature. To date, there has been one article in a practice-oriented law journal that broaches the topic of public art within the context of percent-for-art fees in private development. This Article seeks not only to contribute to the legal academic conversation surrounding public art and percent-for-art ordinances, but posits that these ordinances should be expanded to capture expressly the streetscape and street furniture. Accordingly, this paper will delve into the literature of disciplines such as law, public art, urban design, and urban planning. Broadening percent-for-art ordinances in these two ways helps to rectify the all too often aesthetically mean street in urban America. The effect would be to inject a dose of humanity, delight, and play into this major part of the urban public realm. Other reasons include activating and energizing the American street’s potential for street life, thereby helping to strengthen the urban fabric, attract sustained and desirable private investment, and bring art out of the museums and galleries and literally into the streets. I'm excited to read this piece, as percent-for-art programs are important aspects of many urban planning efforts that have not received sufficient scholarly attention. Michael Gerrard (Columbia) gave Vermont Law's Williams Lecture on April 9 speaking about Climate Change and Land Use Law. Watch it here. I am late on blogging this, but I wanted to offer congratulations to Sarah Adams-Schoen and the new Land Use & Sustainable Development Law Institute at Touro, which held its first held its first conference yesterday. The line-up is below. I heard through the grapevine it was a great success. Space is limited. To register, please click here. Click here to view program/conference brochure. Join local, state and national leaders, land use and municipal law practitioners, planners, legal scholars and community members as we address the formidable challenge of moving from community resiliency planning to implementation. Topics include the newly enacted Community Risk & Resiliency Act, model resiliency codes, the confluence of smart growth and resiliency, legal hurdles to living shores, the role of LWRPs, qualification for the NFIP Community Rating System, and mapping and other practical tools. Pamela R. Esterman, Sive Paget & Risel, P.C. The deadline for submitting abstracts for the Sixth Annual Colloquium on Environmental Scholarship is rapidly approaching: May 1, 2015. The Colloquium will take place on October 3, and I'm excited to share that our keynote speaker will be Professor Holly Doremus, who is the James H. House and Hiram H. Hurd Professor of Environmental Regulation; the Co-Director of the Center for Law, Energy & the Environment; and the Director of the Environmental Law Program at U.C. Berkeley School of Law. Professor Doremus brings a strong background in life sciences and a commitment to interdisciplinary teaching and scholarship to her work at Berkeley Law. She is a leading scholar in the field of environmental law; eight of her articles have been selected for reprinting in the Land Use and Environment Law Review. Her recent publications include Water War in the Klamath Basin: Macho Law, Combat Biology, and Dirty Politics (Island Press, 2008) (with A. Dan Tarlock); Scientific and Political Integrity in Environmental Policy, Texas Law Review (forthcoming); Can the Clean Water Act Succeed as an Ecosystem Protection Law?, George Washington Journal of Energy & Environmental Law (forthcoming); and In Honor of Joe Sax: A Grateful Appreciation, Vermont Law Review (forthcoming 2015). If you have any questions about the event, or about the submission process, please don't hesitate to email me or Courtney Collins (ccollins@vermontlaw.edu). Yesterday, I blogged about an article in the April 4, 2015 edition of The Economist. The whole edition, entited "Space and the city: The high cost of wasting land," is chock-ful of wonderfully researched discussions of land use issues. 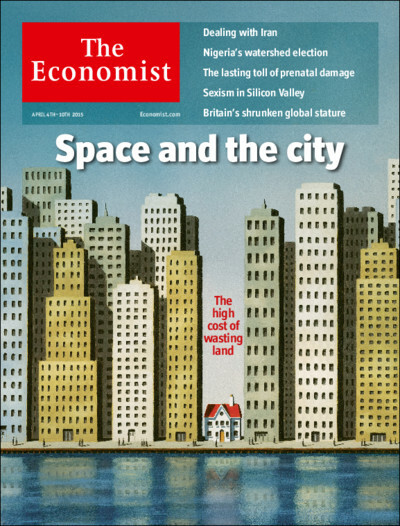 In particular, I'd recommend the lead article, "Space and the city." Since The Economist is behind a pay-wall, I am listing the abstracts of several articles I enjoyed below. It might be easiest, though, to just buy it on your iPad. The Economist 415.8932 (Apr 4, 2015): 11. Land is not really scarce. What drives prices skyward is a collision between rampant demand and limited supply in the great metropolises like London, Mumbai and New York. In the past ten years real prices in Hong Kong have risen by 150%. Residential property in Mayfair, in central London, can go for as much as L55,000 ($82,000) per square metre. A square mile of Manhattan residential property costs $16.5 billion. Even in these great cities the scarcity is artificial. Regulatory limits on the height and density of buildings constrain supply and inflate prices. The costs of this misfiring property market are huge, mainly because of their effects on individuals. High housing prices force workers towards cheaper but less productive places. Lifting all the barriers to urban growth in America could raise the country's GDP by between 6.5% and 13.5%, or by about $1 trillion-2 trillion. Two long-run trends have led to this fractured market. One is the revival of the city as the central cog in the global economic machine. Another trend is the proliferation of green belts and rules on zoning. Zoning codes were conceived as a way to balance the social good of a growing, productive city and the private costs that growth sometimes imposes. But land-use rules have evolved into something more pernicious: a mechanism through which landowners are handed both unwarranted windfalls and the means to prevent others from exercising control over their property. Policymakers should focus on two things. First, they should ensure that city-planning decisions are made from the top down. Second, governments should impose higher taxes on the value of land. The Economist 415.8932 (Apr 4, 2015): 14. Now everyone seems to be an admirer of "special economic zones" (SEZs) that offer a combination of tax-and-tariff incentives, streamlined customs procedures and less regulation. Three out of every four countries have at least one. The world now counts about 4,300 SEZs, and more are being added all the time. Fans of SEZs can point to several success stories, none bigger than China's zone near Hong Kong, set up in 1980 and since dubbed "the Miracle of Shenzhen". The craze for SEZs suggests that governments too often see them as an easy win: make an announcement, set aside some land, offer tax breaks, and - hey presto! - deprived regions or struggling industries are healed. If only it were that easy. Popular as they are, SEZs are often flops. The Economist 415.8932 (Apr 4, 2015): 25-26. For something that ended 150 years ago on April 9, America's civil war is strangely newsworthy. The war has created a divide that has yet to disappear. For all the economic dynamism of the South, which over the past few decades has almost caught up with the rest of the country economically, it remains a region apart, from the bedroom to the ballot box. If you know whether a state was part of the Confederacy, it is possible to make a reasonably accurate guess about where it stands on a range of seemingly unconnected matters, from party politics to gay marriage. Does race explain the persistence of difference? This may have been true in the 1960s and 1970s, when the Republicans energetically wooed southern white Democrats who were outraged by Lyndon Johnson's civil-rights laws. But it no longer fits. Religion is a better explanation of southern exceptionalism. The civil war divided most of America's Protestant sects, says Mark Noll of the University of Notre Dame. LAND prices mainly reflect location: farmers may till the soil, or drain it, but most increases in land’s value comes from the activity of other people. Nobody builds skyscrapers or shopping malls in the wilderness. Landowners, in other words, enjoy unearned income from the benefits bestowed by good transport links, and proximity to customers, suppliers and other businesses. Once they have bought their land, they keep this money. But why not tax it? That simple but revolutionary idea has deep roots. David Ricardo termed unearned income from land as a pernicious anomaly: “that portion of the produce of the earth which is paid to the landlord for the use of the original and indestructible powers of the soil”. His best-known follower was Henry George, perhaps the only tax theorist in history whose beliefs have become the object of almost cult-like devotion. One of his fans invented the game now known as Monopoly, to exemplify the evils of untaxed rent. In a book called “Progress and Poverty”, published in 1879, George argued that land-value levies should replace all other taxation, leaving labour and capital to flourish freely, and thus ending unemployment, poverty, inflation and inequality. His modern adherents rarely go that far, but land-value taxation (they prefer to call it a location fee) does have many theoretical virtues. . . .
A good job for a houser...from the ABA listserv. This is a reimbursable detail opportunity not to exceed 1 year. The detail may be extended if all parties are in agreement. Responsibilities and Opportunity Offered: The responsibilities for the detailee selected under this announcement will include: (1) conducting investigations to assess possible violations of the civil rights statutes mentioned above, including conducting legal and factual research, interviewing witnesses, analyzing data and evidence, and making recommendations as to whether to bring enforcement litigation; (2) handling litigation (both pattern or practice and individual matters referred by the Department of Housing and Urban Development (HUD) or other agencies) to redress violations of federal civil rights laws, including preparing legal briefs and memoranda, preparing and responding to discovery requests, conducting extensive document review, identifying and working with expert witnesses, preparing witnesses and participating in depositions, and developing and presenting the government's case in federal court; (3) preparing for and participating in settlement negotiations and mediation on behalf of the Department, 4) monitoring including preparing and negotiating the terms of proposed consent decrees; (and enforcing compliance with judgments and consent decrees; (5) recommending and reviewing private litigation for intervention or amicus participation; (6) conducting outreach to civil rights organizations, state and local governments, industry, and other stakeholders; (7) analyzing and preparing responses to inquiries from the public, testimony, legislative proposals and other written materials; and (8) coordinating as necessary in the execution of the above duties with United States Attorneys' Offices, HUD and other partner agencies. For those heading to the American Planning Association conference in Seattle this weekend, it appears there will be a lot of great land use law panels there. Here are some I saw from the conference brochure. What zoning and building-code standards are needed to ensure agritourism activities are appropriate and safe? Learn about APA Washington’s advocacy to meet today’s emerging challenges. Is the zoning system due for an overhaul? Five national experts discuss and debate. See a proposal for a system with a 100-year planning horizon and transferrable development rights. How can zoning be used to implement planning most effectively? See examples from five communities. This new APA Planning Advisory Service Report presents an innovative approach to regulating on-premise signs. Explore the skills, approaches, and strategies needed to write a zoning or development code. Learn how to use zoning and other regulatory tools to create safe, convenient bicycle infrastructure networks. Learn how ADA compliance programs can help jurisdictions document and correct pedestrian barriers. Zoning codes need constant maintenance. Look at key issues, and methodologies for addressing them. Ensure your local land-use regulations don't conflict with federal fair housing law. Learn how to craft form-based codes with clear outcomes — and post-adoption challenges — in mind. Planners and mediators discuss how their professions overlap and benefit each other. Learn how innovative towns and cities are expanding housing choices in existing neighborhoods. Gain insight into how to overcome common legal obstacles to permitting urban agriculture. See how integrating public health rounds out land-use decision making and local comprehensive plans. Planners share tips and techniques for making green infrastructure the first choice for stormwater management. Explore how planners and lawyers can work together to achieve balanced growth and development. Review findings from a national study of how community-level zoning code reforms affect physical activity. Explore how preserving older, smaller buildings advances walkability in historic neighborhoods. Learn how form-based codes can allow block-by-block implementation of transit-oriented regulations in underperforming urban centers. See a GIS model created to identify valuable conservation areas in five North Carolina counties. This study analyzes potential walkability surrounding transit-oriented development in a growing Texas community. Are communities that adopt code reforms more likely to foster environments that encourage active living? 2:15 p.m. - 5:45 p.m.
Tour three interrelated projects that highlight neighborhood connectivity in the highly walkable city of Kirkland. Transportation: Motorcoach, walking. Content neutrality is a land mine for local sign ordinances. Get an update. Examine legal and land-use trends and practices for regulating wineries, distilleries, and marijuana. Student housing needs are growing. Learn how zoning and development regulations can mitigate unwanted impacts. Tour downtown open spaces developed through zoning incentives to gain floor area for buildings. Transportation: Walking. Glean pointers to help prepare for any type of disaster as well as longer-term resilience. Discuss the problems with PUD zoning and hear how three cities adopted a more flexible, resilient zoning strategy. For those heading to the APA conference in Seattle this weekend, I wanted to make a hearty recommendation that you attend the session below on agritourism. (I was initially supposed to speak on the panel, but have had to bough out because of some personal timing conflicts.) It is going to be a great event, and Tricia Nilsson will be discussing some of the work that my Clinic has done with her on agritourism. I guarantee it will be well worth your time and, I hear, Tricia will be raffling off some wine from some of the region's premier wineries! Agritourism — such as farm weddings, you-pick-it operations, and farm stays — is becoming a popular way for farmers to increase their incomes. But it has come afoul of local zoning and building codes. What zoning and building-code standards are needed to ensure agritourism activities are appropriate and safe? Patricia Nilsson has been a public sector planner in Virginia, Pennsylvania, and Idaho for more than 30 years. She has extensive experience in long-range planning, and has been a project manager for comprehensive plan and zoning ordinance updates, a multi-million dollar open space program, and transportation plans. She is currently the Director of Development Services for Canyon County, Idaho. She is a past president of the Idaho Planning Association (predecessor of the Idaho chapter of the American Planning Association) and a member of the American Institute of Certified Planners. Ms. Nilsson received a bachelor’s in Political Science from Virginia Tech. Having an interest in both physical and social sciences, Scott Mendoza chose to study geography and land use planning at Weber State University (in Ogden, Utah) where he was given the opportunity to combine elements of both science disciplines into one degree. This field of study has enabled Scott to hold employment positions in the private sector as well as city, county, and federal levels of government. Past relevant employers consist of a private land survey firm, the US Forest Service, Ogden City Neighborhood Development, Davis County Engineering, and the Weber County Surveyor’s Office. Currently, Scott works as a principal planner for Weber County where he primarily focuses on long range planning issues and code development. Scott enjoys the creative outlet and challenge that comes with integrating new and progressive ideas into land use codes. Recently, Weber County was recognized by the Utah Chapter of the American Planning Association for its efforts in crafting and adopting an innovative mountain resort development code and an easily adaptable agri-tourism code. On April 6, 2015, Arkansas' governor signed into law SB 757, a law that may either end zoning in Arkansas...or not. On its face, the law is a bludgeon to zoning laws: it seems at first to require local governments to compensate for a "taking" where a "regulatory program" causes a decrease of "at least 20%" of the fair market value of real property. Zoning laws are specifically mentioned within the definition of a "regulatory program." Whether this law is, in fact, a bludgeon to zoning, or a completely meaningless piece of legislation, depends on how you read the second half of the definition of "regulatory program" in 5(B). The first part of the "regulatory program" definition seems to include almost all aspects of today's zoning laws in its ambit; however, the law then provides that such regulations are only within the law's scope "when the regulatory program is not designed to carry out or protect the adopted plans of a governmental unit that are designed to protect the health, safety, or welfare of the citizens." Here's my question: aren't all zoning laws premised on an exercise of the police power (e.g., health, safety, welfare, etc.)? I think that is a pretty low bar to meet. However, the other issue is how (5)(A) relates to (5)(B). Perhaps the police power limitation only applies to the second part of the definition in (5)(B). In that case, (5)(A) would provide that "'Regulatory program' means a rule, regulation, law, or ordinance that affects the fair market value of real property." This more broad definition does not have the exception for police power-enacted laws. Does the explicit reference in (5)(B) exempting zoning laws premised on the police powers mean that they are also exempted from (5)(A)? These ambiguities will seemingly make a major difference in whether Arkansas's local governments can continue on with zoning programs. I am writing this very quickly: what do others see that I missed? (a)(1) An owner of real property asserting a taking under this 10 subchapter shall bring a cause of action in circuit court claiming that the implementation of a regulatory program by a governmental unit has permanently reduced by at least twenty percent (20%) the fair market value of the real property. (2) The reduction in the fair market value of the real property shall be determined by comparing the fair market value of the real property as if the regulatory program is not in effect and the fair market value of the real property determined as if the regulatory program is in effect. (3) To assert that a taking has occurred, the regulatory program must have been implemented at the time the owner acquired title or after the effective date of this subchapter, whichever is later. (4) Upon a preponderance of the evidence, the real property shall be deemed to have been taken for the use of the public. (b) A jury shall determine the amount of the difference in fair market value. (5)(A) "Regulatory program" means a rule, regulation, law, or ordinance that affects the fair market value of real property. (B) "Regulatory program" includes without limitation moratoriums on growth, aesthetic or scenic districts, environmental districts, overlay districts, green space ordinances, landscape ordinances, tree ordinances, land use planning programs, and zoning programs by a governmental unit when the regulatory program is not designed to carry out or protect the adopted plans of a governmental unit that are designed to protect the health, safety, or welfare of the citizens. Many thanks to Celeste Pagano, who sent this my way. Rivka Galchen has a nice article in this week's New Yorker on earthquakes resulting from hydraulic fracturing. Check it out here. On Monday, Idaho's governor signed a first-in-the-nation law fully preempting any local government regulation of ride-sharing companies, such as Uber. This is terrible precedent; no other state has gone anywhere near this kind of override of local control as best I can tell (I welcome corrections, if I'm wrong). Folks in other states with legislators who better understand the realities of the sharing economy should take note that this is a new tack by Uber, and oppose it. This approach confuses a pro-Uber law with a pro-markets law; the primary result of the Idaho law will be to put taxi companies out of business. That's not choosing "freedom," that's altering the marketplace to favor one company. The Idaho law is clear of the new tack to fight regulation by the sharing economy: move regulation at the state level, then capture the regulator and make it weak. This move is as old as administrative law itself and should be fought vigorously in other states with more at stake. I am delighted to announce that a collection of short essays resulting from the inaugural Idaho Symposium on Energy in the West is now available on SSRN and will be published this fall in the Idaho Law Review. The topic of the Symposium was "Transmission and Transport of Energy in the Western U.S. and Canada: A Law and Policy Road Map," which also forms the common theme for this essay collection. The collection includes great contributions by KK Duvivier, Troy Rule, Melissa Powers, Sam Kalen, Tara Righetti, Nate Larsen, Nick Lawton, and Amelia Schlusser. Topics include: building a resilient legal architecture for western energy production; regulating natural gas flaring; transmission planning for wind energy; utilities and rooftop solar; special considerations for western states and the Clean Power Plan; the Clean Power Plan's implications for the western grid; siting renewable energy on public lands; and implications of utility reform in New York and Hawaii for the Northwest. The 2nd Idaho Symposium on Energy in the West will be held in Spring, 2016. Watch for event details and more great scholarly contributions for understanding energy in the west!